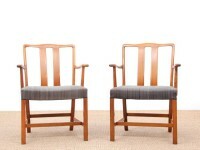 The history of Fritz Hansen begins in 1872, when the enterprising cabinet-maker Fritz Hansen from Nakskov obtains a trade license in Copenhagen. 1885 is a decisive year, in which he starts his own furniture production company and two years later he has established a flourishing workshop in Christianshavn – a central part of Copenhagen. Fritz and his son Christian introduced the standard of high quality that has been the trademark of Fritz Hansen’s products ever since. 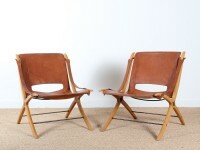 The long list of prestigious orders from the first fifty years of the company's history demonstrates the strength of the Fritz Hansen reputation at the beginning of the 20th century. Buildings furnished by Fritz Hansen include Christiansborg, The University Library, Copenhagen City Hall and The Supreme Court and other significant projects. Early in the century, the forward-looking Christian E. Hansen, son of Fritz Hansen, starts to experiment with steam bending beech. 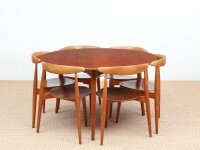 In the Thirties the technique is so refined that Fritz Hansen is among the world leaders in the field, which later evolves into the firm’s speciality: Furniture created in laminate wood. Despite difficult times during the decade of The Second World War, the Fritz Hansen factory is expanded. Some particularly hard, cold winters see many of the Danish walnut trees succumb. Fritz Hansen buys a great amount of the wood and takes advantage of the situation: A new furniture series in walnut is introduced. The initiative receives great press attention and is a success. 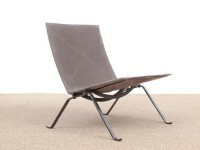 The first classic of the decade is the China™ chair from 1944, designed by the progressive architect Hans. J. Wegner. 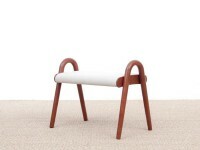 The chair is a sculptural celebration of wood and the fine craft of furniture making. The second classic to see the light of day is the spoke back sofa by Børge Mogensen in 1945, which is later re-introduced as the most Danish sofa of all sofas. 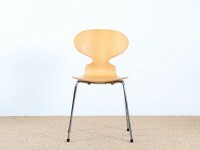 Arne Jacobsen totally dominates the Fifties at Fritz Hansen. 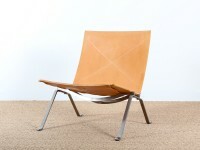 The collaboration started in 1934, but the breakthrough comes when he creates the laminated Ant™ chair. 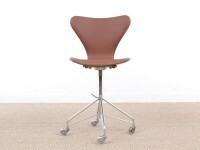 The chair later gave rise to the never-ending success story of the Series 7™ chair – and other pressure moulded veneer chairs. 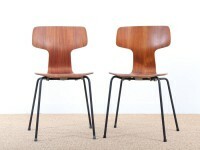 The inspiration for the Ant came from Hvidt & Mølggard’s AX-series, and the introduction of the lamination technique and separable furniture is still a milestone in the history of Fritz Hansen. In 1963, the factory in Allerød is expanded with three factory halls and in 1965 the administrative department moves from Christianshavn to the renovated buildings in Allerød, which also include a showroom. 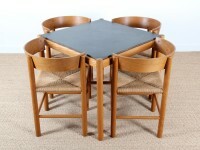 The democratic table with no ends, the Superellipse™ table, and the span-leg table are designed by Bruno Mathsson and Piet Hein and becomes one of Fritz Hansen’s greatest successes. 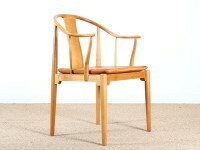 Just as successful is the re-introduction of Børge Mogensen’s ‘Tremmesofa’ and Hans Wegner’s China chair. 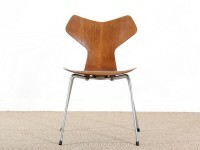 The Arne Jacobsen models also strongly dominate this period. This decade brings great changes to Fritz Hansen: On the first working day in 1979, Fritz Hansen announces that the 107 year old firm is no longer in the hands of the family. 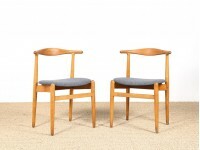 75% of the Fritz Hansen shares are now owned by Skandinavisk Holding. The enfant terrible of Danish design, Verner Panton, becomes leader of the avant-garde, provoking and inspiring in the service of Fritz Hansen. His prominent role results in praise from the press. The attempt to guide interest back to Arne Jacobsen and the other classics is initiated and comes to fruition a few years later. An exhibition consisting only of new Fritz Hansen models, shown during the Furniture EXPO 1983 at the Bella Center, a trade fair and convention centre in Copenhagen, becomes a convincing manifestation that the old firm isback on the scene and is recapturing the position as Denmark’s leading furniture company. The period is marked by a focus on office chairs and the introduction of the Ensemble-series by Alfred Homann, chairs and tables by Vico Magistretti, the Click-table series and screens from Art Andersen & Copenhagen. The introduction of the concept Republic of Fritz Hansen™ marks a change in strategy. 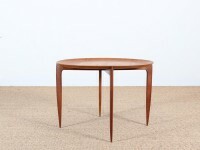 The message is that furniture from the Republic of Fritz Hansen is an important part of the image of companies and private customers who are looking to express their individuality and make unique statements. 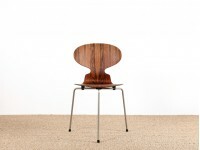 The Republic of Fritz Hansen invites a series of new designers to interpret the design philosophy of Fritz Hansen. The Ice-series by Kasper Salto and Plano by Pelikan Design is introduced and lives up to the high expectations. 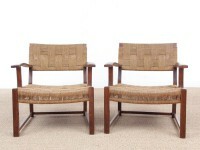 Mid-Century Modern pair of arm chairs with woven sea grass.